Uchuu Kyoudai 3 ~ why do I feel so embarrassed now? 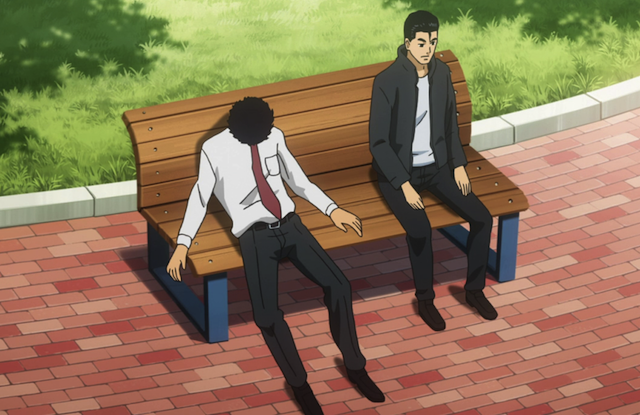 In episode 3 of Uchuu Kyoudai (Space Brothers), Mutta Namba is subjected to a number of examinations that leave him feeling humiliated in more way than one. We also get a proper introduction to Serika Itou. The episode had a couple of genuinely amusing moments, and pushed through the majority of the week-long series of examinations that a candidate for JAXA’s space program needs to pass. 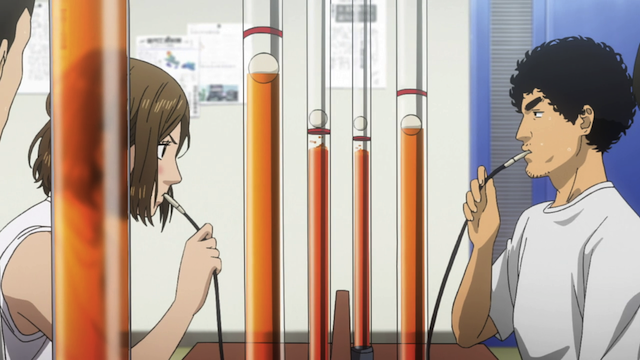 Serika Itou and Mutta Namba in the lung capacity exam. Anyone familiar with astronaut training programs (or their depictions in film) is likely aware of the lung capacity exam, in which the exam subjects must blow through a tube to keep a ball aloft for as long as they can. Surprisingly Mutta seems to think this is the one test he has a chance of “winning”. Surprising, that is, until we are reminded of young Mu-chan’s training with the trumpet. This was a great example of planting evidence in a previous episode to support a thesis later on, and it is a very good indication of quality writing to come. Mutta Namba (left) and Kenji Makabe (right). Mutta, dispirited that he isn’t able to best his fellow examinees, complains that he is more of a side-kick character. Kenji, who was introduced as a can-do character who didn’t let the screw get to him, cheers Mutta up, and thus shows that his strength of character is a real positive, not just for himself, but also for his team mates. 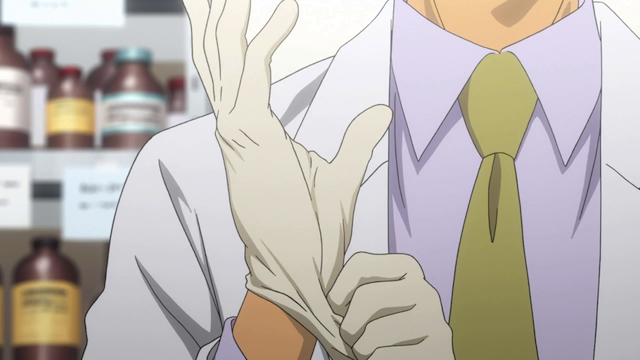 After this episode, there are two days of tests remaining, and there was also a hint of a “secret third exam”. Mutta seems to believe he is destined for failure, but there are times when he powers through regardless. "She definitely thinks I'm a weirdo now." 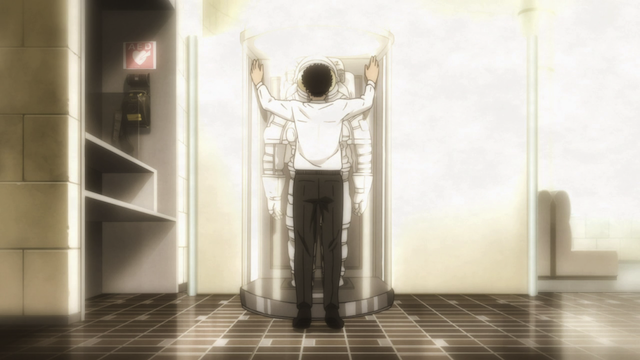 "Dear Diary, today I saw a man press his body against the spacesuit display. He looked suspicious." Throughout the episode we got to learn a few things about Serika Itou. She is a doctor. She is also in great athletic condition. She seemingly operates in pretty much her own world; for example, when she was in the lung capacity test, the only thing she seemed to be aware of was the ball she was trying to keep afloat. Also, when she returned to her hotel room for the night, it became clear that she keeps a diary in which she records banal things, such as how she ate a lot of broccoli for lunch. Mutta delivers a little something for the fans. This was a great example of planting evidence in a previous episode to support a thesis later on, and it is a very good indication of quality writing to come. I love how seamlessly this was used here. I mean, I thought the trumpet thing was used well enough in the previous episode and didn’t need to reappear, but I’m glad it did. I was thinking the same thing about the trumpet. It worked in that episode, but it probably wouldn’t make a reappearance, and then it turned out to have relevance again in a perfectly logical way. Great! 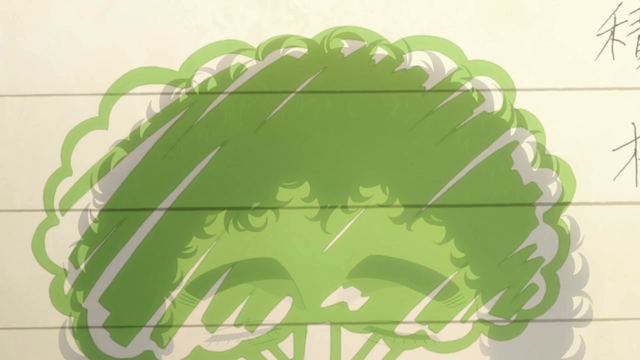 What really impressed me with this episode was the connection of the trumpet playing from the second episode and the lung capacity test that Mutta took in this episode. It showed the substance behind that scene before it even was announced and gave us a reminder to show that he should overcome this challenge. I’ve always liked it when they show development this way rather than having him take the test, then flashback and us learn he played the trumpet, and then go forward. 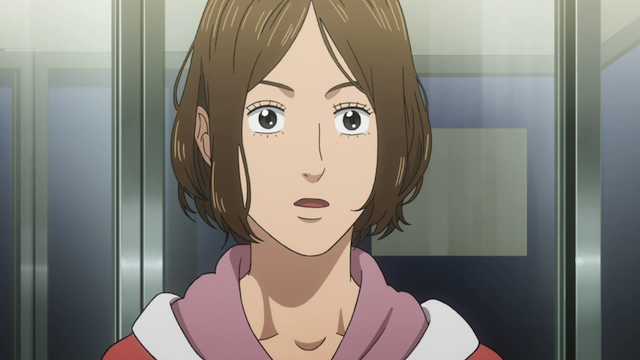 While that’s fine for showing character development, what Space Bros did was much more impressive and much more respectable as a form of storytelling. Stuff like this is what separates the outstanding anime from the great anime. Completely agree. They handled that quite well. I have high hopes for this show. If they can keep going at this level, it will be a series to cherish.